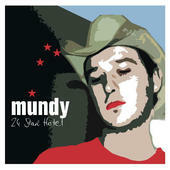 Following the promotion and touring of Jellylegs, Mundy started recording his second album but it was then that problems started to arise between Mundy and his then record company Sony as to how commercial the songs should be. These ongoing differences failed to be resolved and in January 2000 Mundy and Sony parted company. It was then that Mundy took some time out to travel, all the time wondering if he could survive without a record company. Deciding that he could, he started his own record label Camcor Recording and released an EP The Moon Is A Bullethole and a single ‘Mexico / July’. Critics and public alike enthusiastically received both releases and it was only a matter of time before his album, ’24 Star Hotel’ would follow. ’24 Star Hotel’ was a collection of 12 songs, written between 1996 and 2000 dealing with love, life, addiction and travel, recorded in London with legendary producer Tommy D. 24 Star was a slow burn but as Mexico and July picked up play at Irish radio and Healthy became a live favourite Mundy began playling Irish festivals, suddenly everything gelled and 24 Star went on to become one of the biggest Independent releases of it’s time. It has sold over 45,000 copies in Ireland alone.